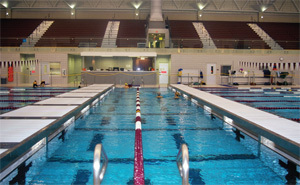 Oklahoma High School pool’s IAQ has been graded the highest of nearly any pool in the United States at a recent Speedo Championship meet, thanks to a combination of its HVAC system and a Paddock Evacuator system that eliminates chloramines that cause Lifeguard Lung and other respiratory problems, claims Seresco. We bring you the case study. Even in perfect environments of proper ventilation, temperature and relative humidity, chlorine molecules attach to ammonia and other organics introduced by swimmers, resulting in a heavy, noxious gas that congregates at the pool’s water surface, causing respiratory irritations. Natatorium (a building housing a swimming pool) ventilation design strategies typically direct supply air towards the perimeter and down to breathing zones at the deck surface, but very little on the pool surface. 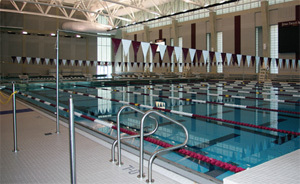 Seresco Technologies, which specialises in indoor pool and IAQ dehumidification, used a new combination of HVAC and exhausting chloramines from the pool surface, which now promises to be the future solution for Lifeguard Lung – a respiratory disease endemic among lifeguards – and other respiratory ailments, which plague swimmers at many of the nation’s indoor pool facilities. The new $19 million Oklahoma High School natatorium has earned appreciation for its Indoor Air Quality (IAQ) with its innovative HVAC design. The new 50,000-square-foot Jenks Trojan Aquatic Center (JTAC) in the small Tulsa suburb of Jenks, Oklahoma, passed its first major IAQ test with plaudits last March, hosting 626 swimmers, 80 coaches, 60 volunteers, 30 referees and more than 1,000 spectators at the Speedo Championship Series Central Zone Senior Sectionals. Similar major swim meets across the nation are frequently marred by poor breathing conditions brought on by chloramines build-up not properly removed by the facility design and HVAC system. However, the JTAC and its 50-metre, 13,000-square-foot pool, say the event officials, proved that the school natatorium can act as a model for designs and retrofits. Led by Ben Ferem, Jenks Public School’s District Executive Administrator, the design team included, consulting engineer firm SHW Group, Plano, Texas; architect, Mark Bragg, principal, KSQ Architects, Tulsa; Pool Consultant Richard Scott, AIA, principal, Aquatics Excellence, Austin, Texas; and two manufacturer representatives for Georgia-based dehumidifier manufacturer, Seresco USA Inc –Engineered Equipment Inc (EEI), Tulsa, and Texas Air Systems, Irving, Texas. The aim of the project was to maximise indoor air comfort and system operation and minimise respiratory problems of those using the pool facilities. In order to achieve this, it was important to reduce chloramines. JTAC gave specifications for two custom-manufactured Seresco NE Series 64-tonne energy recovery dehumidification systems combined with one of the first applications of a new chloramines source capture/exhaust system manufactured by Paddock Pool Equipment Inc, Rock Hill, South Carolina, a commercial pool equipment manufacturer. The Seresco units heated or cooled the space to 82°F and dehumidified to 55% relative humidity. Installed by the project’s mechanical contractor, Mechanical Air Systems Inc (MASI), Broken Arrow, Oklahoma, each 46,500-cfm unit was used to recover compressor heat for pool water heating. They also used energy-saving direct drive plenum fans with variable frequency drive control. Indoor air comfort and system operation was streamlined with WebSentry, Seresco’s proprietary factory-based 24/7 remote monitoring/control service that communicates with each unit’s Command Center via the Internet. The WebSentry connection to the JTAC’s dehumidifiers Command Center systems allowed factory technicians or authorised service techs to monitor and control more than 100 operating parameters, including real-time refrigerant pressures – avowedly an HVAC industry first. The ventilation specification added Paddock’s new Evacuator, a chloramines source capture/exhaust plenum-type of device integrated into one width of the pool gutter system that draws and exhausts chloramines directly off the pool surface. The exhaust air contribution from the chloramines source capture/exhaust system was factored into the building’s overall negative pressurisation, which is a critical design criterion in all natatoriums. While it can exhaust independently of the dehumidifiers, the project saved significant equipment costs, because the chloramines source capture/exhaust system is ducted to fans in the Seresco units, which carefully monitor and control the entire building pressurisation status via their Command Center microprocessors. Equally important was the positioning of the chloramines source capture/exhaust system at the pool edge nearest the natatorium’s return air grille, which helps draw chloramines towards the evacuation system. Pool builder KC Gunite Inc, Belton, Missouri, installed the 174 x 75-foot pool, pool equipment, gutter system and the chloramines source capture/exhaust system. Even though chloramines’ reduction will extend the facility’s lifecycle longer than most indoor pools, KSQ Architects’ design team led by Bragg still chose materials that withstand the hostile environments of natatoriums. The entire pool surface was tiled instead of plastered, for example. And many square feet of wall surface use Kerlite, Sassuolo, Italy, porcelain wall coverings that resist corrosion and coordinate with the pool tile texture. SHW Group’s ventilation design was created to maintain a comfortable environment in the 1,200-seat spectator section. The dehumidifiers were installed strategically to condition the area for typical daily use. But in the event of heavily attended swimming meets, the HVAC system also activates an AAON, Tulsa, Oklahoma, conventional make-up air package unit that functions as a back-up when temperature or CO2 target levels can’t be maintained during full occupancy. Another integral part of the ventilation design was white Sedona-Xm premium textile HVAC duct, which has an antimicrobial agent built into the material to minimise the harboring of biological contaminants that commonly occur in natatorium metal ductwork. Manufactured by DuctSox, Peosta, Iowa, the main pool area has four runs of 54-inch-diameter duct each with two airflow devices for adjusting air distribution inside the duct. The linear array of vents was installed to span the entire length to assure an even and gentle distribution. The factory-engineered Comfort-Flow air dispersion porosity was integrated to allow a small percentage of air to flow through the fabric to eliminate dust build-up and condensation. The spectator area was fitted with a 42-inch-diameter duct from its dedicated HVAC system. With a heavily attended meet such as the Speedo Championships, the JTAC proved that it was a role model with a design that should be considered in all new and retrofitted natatoriums. The meet’s US swimming referee and 2012 Central Zone Officials’ Chairman, Stephen Potter, surveyed 100 participants on JTAC’S facility conditions and recorded a 3.9-rating (on a scale of 1 to 4) evaluation for IAQ. It was by far the highest recorded air quality rating in the last 10 major meets held in the seven-state region’s premier venues. The JTAC’S IAQ was rated the best the officials had seen at a major swimming competition. There were no signs of coughing or burning eyes witnessed and the environment was regarded comfortable for swimmers and spectators alike. The dehumidifiers’ heat recovery capability offers the district the opportunity to integrate free 80°F pool water heating in future. Besides the IAQ, the benefit of maintaining tight relative humidity and temperature tolerances, the units also save JTAC operating costs through energy efficiency. On days with ideal outdoor conditions, the system also shifts into economiser mode for additional energy savings. Unit operation, monitored daily by the factory, can detect operating trends or component failures that might affect the HVAC conditions in the natatorium. In the event of a performance alarm, the unit sends notifying emails to authorised Jenks employees. The vital statistics, and especially recorded trending information, gives Seresco factory technicians enough details to help support local HVAC service technicians on any issue that arises. “Venues struggling with air quality should make a trip to Jenks to see their unique set-up and the facility should be strongly considered for the next available Central Zone or Sectional Championships,” said Potter, a 45-year veteran of swimming competition. “The success of this facility is really due to the foresight of the design team,” echoed George Villarreal, JTAC’s manager and a 20-year swimming industry veteran. Note: This non-proprietary case study focuses on the architect and mechanical engineer’s design vision and mentions many architectural and HVAC brands such as DuctSox and Kerlite, as well as the pool builder and the mechanical contractor.